They could have spent spring break vacationing, but some of our students made an impact on the world instead. They headed in all directions — to clean shorelines in Kentucky, help immigrants in Indiana and work on a community garden in Tennessee, among numerous other volunteer projects. They’re our Huskie Alternative Spring Breakers, and they’re bursting with passion to help others and a desire to make a difference. We share their values here at NIU, and our unique service-learning program puts them in the thick of today’s social issues. We just know our Huskies are going to find ways to change the world. 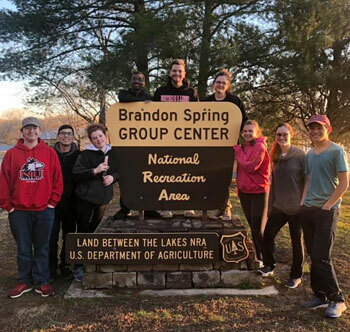 “You can go on vacation anytime,” said Skyler Imhoff, site leader for a trip to Golden Pond, Kentucky, where students volunteered with the Land Between the Lakes National Recreation Area. Imhoff and many of her fellow Huskies recently embarked on a week’s worth of service. Their efforts went beyond helping as they soaked in everything around them. 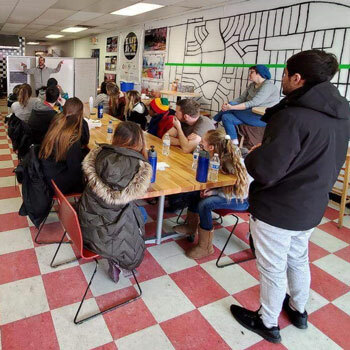 Every Huskie Alternative Break trip engages students in projects for nonprofit organizations. We offer a glimpse into the hard work they put it. From shorelines to a campground to a prairie, the 12 students volunteering with Land Between the Lakes National Recreation Area were everywhere. They cleaned up debris and helped remove old fencing, among other efforts. Students from all sorts of majors, with a variety of interests, worked together and bonded as they spent time outdoors improving the environment, said Imhoff, a 21-year-old communications major from Marion who aims to enroll in NIU’s Adult and Higher Education graduate school upon graduation this May. “I’m never going to get a chance to do something like this again,” she said. “Everyone who worked was so passionate about what they’re doing and dedicated." A small but mighty group, three students and a chaperone volunteered for La Casa de Amistad, which provides educational, cultural and advocacy services to a community of Latino and Hispanic youth and immigrants. They helped with the nonprofit organization’s after-school program, the food bank and a citizenship class. They served alongside 12 students from Slippery Rock University of Pennsylvania and found themselves featured in the local news at least twice. Memphis brought lessons in social justice, as well as the history of southern culture to our Huskies volunteering through Serve901. Among the group’s numerous stops were the Soulsville Garden, LeMoyne Owens College, the Memphis Medical District Collaborative, the National Civil Rights Museum and LeBonheur Hospital. The experience at the hospital — a home as much as a hospital to many of the patients and their families — stuck with 20-year-old Jacqueline Aguilar, a nursing major and one of six students on the trip. The small touches — paintings on the ceiling for bedridden children, personalized toys — inspired her to consider switching from forensics to pediatric nursing. 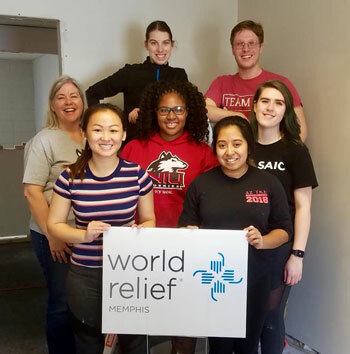 The students gained perspective as they painted an office for World Relief, gathered traffic data, worked in the garden and simply chatted with everyone there.